Realistically, I don’t think any cream can reverse the ageing process on older skin once the wrinkles are there. But, hopefully, we can use creams to soften the appearance of those wrinkles and forestall the appearance of new ones. I am also concerned about keeping my skin clean and clear of blemishes. I have used many different types of skin care, including prescription creams from the dermatologist, and I am always interested to see what active ingredients are included. According to the label, this moisturizer contains Vitamins C and E, Matrixyl 3000 and hyaluronic acid, all powerful skin regenerating ingredients. Also included are Peppermint Oil, Shea Butter and Green Tea extract. This product is sold with a 100% reimbursement guarantee, which is always reassuring. As usual, when testing skin care, I discontinued my previous serum and moisturizer. When I started using Bodi Skincare’s Anti-Aging Moisturizer and Hyaluronic Acid Serum in combination, I was a bit astounded at the outcome. The result of using these products together has cleared my skin beyond my expectations. I use the two products twice a day: in the morning and at bedtime. After washing my face, I apply the Hyaluronic Acid Serum and within seconds can feel my skin tightening. I wait for a few minutes until that sensation passes, and then apply the Anti-Aging Moisturizer. I particularly like the fresh peppermint scent of the moisturizer. Although the scent dissipates quickly, the moisturizer leaves my skin feeling soft. This cream has a light and penetrating texture and comes in a bottle with a pump dispenser. I like that the bottle is transparent in the mid-section; it is easy to tell how much product remains. The bottle contains 1 oz or 30 ml, fairly average for a specialist product. Although I agreed to try these products in return for an honest review, I will be buying replacements because the combination of the two is the best I have used. Over the years, I have used countless preparations to reduce the appearance of cellulite. Some help and some don't do much. What I have noticed is that, for me, the ingredient that works best is caffeine. In this cream, Caffeine and Retinol are combined with a fat burning agent, Coenzyme A, and with Glaucine, a plant extract with anti-inflammatory properties. I have used BodiShape’s Slimming Contour cream for a period of three weeks in conjunction with the BodiSure Massager (made by the same company). I must say I did not really see any improvement for the first week or ten days, but I kept using the combination of cream and massager and I'm so glad I did! As well as addressing some pretty stubborn cellulite, I really like how my dry skin feels smoother and softer after each application. To give this cream a thorough testing, I used it on my arms only to start with, and after a number of uses I could feel a definite difference between the skin on my arms and legs. I believe the nourishing effects of this cream last longer than those of other specific body lotions, so that is a definite plus I did not expect. I tested this product in return for an honest review and was impressed with the improvement in my skin in a relatively short period of time. I believe that with regular use, the benefits will be even greater. 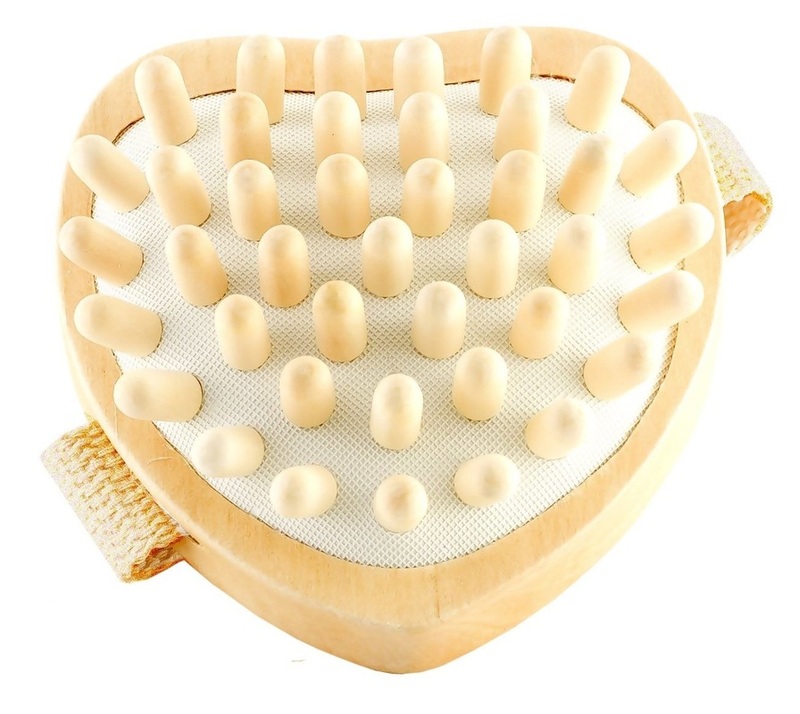 The BodiSure massager has 41 hard rubber nodules set in a heart-shaped wooden frame with a strap across the back. The strap is non-adjustable and large enough to fit almost any hand. But that also means it is not tight enough against smaller hands to prevent slippage. I found it easiest to put my hand under the strap, grip the top of the heart with my fingers, and cup my hand against the strap. By holding the massager thus, it did not slip from my hand as I massaged. The massager is designed to stimulate circulation and reduce the appearance of cellulite. Instructions say to “Use in a hot shower massaging in up and down motion for 5-10 minutes.” I found that awkward (I don't usually spend 10 minutes in the shower) and prefer to use the massager while I sit comfortably in a chair, particularly as I like to use it to massage the bottom of my tired feet. In fact I use this massager for much more than to reduce cellulite. I have used the massager dry, but prefer to use with a lotion as the lotion allows the nodules to glide more easily across the skin. I can feel my skin tingle during the massage and afterwards. And my feet do feel better after stimulating the skin. I agreed to test the massager in return for an honest review. I like this massager a lot and will continue to use it. I think it does a very good job of stimulating circulation. I have used formulations containing hyaluronic acid, but apart from how much active ingredient is actually in the bottle, it seems that the synergy with other components is crucial. According to the label, this serum contains Vitamins C and E and Lavender Essential Oil, all powerful skin regenerating ingredients, and Aloe Vera and Witch Hazel, soothing and tightening. It also contains L-Arginine, an amino acid which drives other active ingredients deep into the tissues. This product is sold with a 100% reimbursement guarantee, which I find reassuring. As usual, when testing skin care, I discontinued my previous serum and moisturizer. When I started using Bodi Skincare’s Hyaluronic Acid Serum and Anti-Aging Moisturizer in combination, I was a bit astounded at the outcome. The result of using these products together has cleared my skin beyond my expectations. I use the two products twice a day: in the morning and at bedtime. After washing my face, I apply the Hyaluronic Acid Serum and within seconds can feel my skin tightening. I wait for a few minutes until that sensation passes, and then apply the Anti-Aging Moisturizer. This serum comes in a bottle with a pump dispenser. I like that the bottle is transparent in the mid-section; it is easy to tell how much product remains. The bottle contains 1 oz or 30 ml, pretty normal for a serum. Although I agreed to try these products in return for an honest review, I will be buying replacements because the combination of the two is the best I have used.